... sending postcards: merry christmas! What a cute postcard!!! Merry Christmas!!!!!!!!!!! oh my gosh perfect photo!! merry christmas and happy holidays! Digging the ear muffs. Merry Christmas! Happy Christmas you two! Hope you're enjoying Spain!! 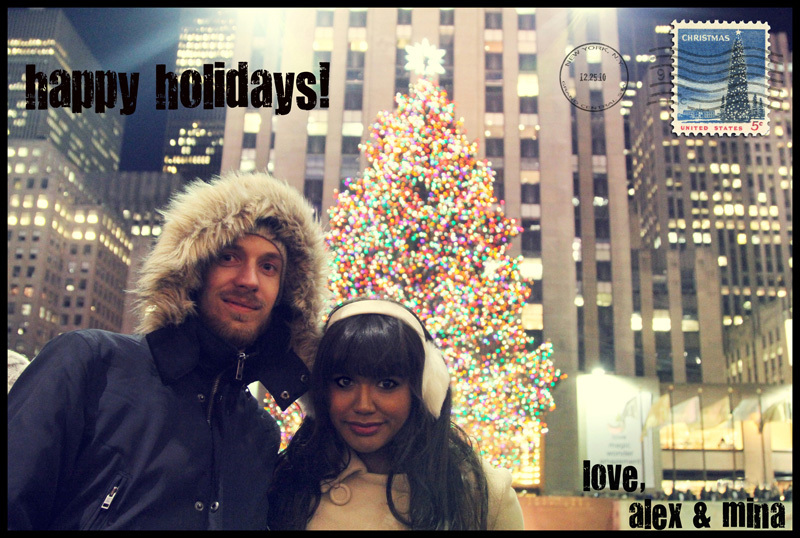 Happy Holidays my dear friends! Mina, i think I have those same earmuffs! (urban outfitters?!) haha I'm wearing them in a few Christmas pictures! You're right, getting to that tree was craziness! We had to sidestep vomit to make it there... Good luck with Times Square, I'm sure you guys will have a great time! We'll be in Brooklyn and Union Hall! P.S. Alex gave me those earmuffs as an xmas present a few years ago. They're from the Gap. Love the photo! Hope you had a great Christmas!